Creating a customized household cleaning schedule is a great way to ensure your home looks and feels clean and inviting to everyone who enters. On the internet you can find plenty of examples of generic cleaning schedules, but is there any such thing as a generic house? I don’t think so. 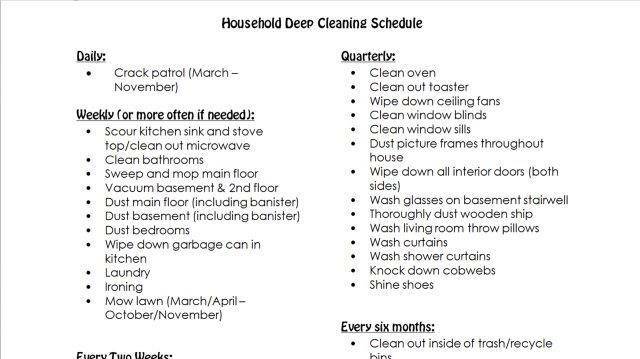 That’s why I’d like to show you how to quickly and easily create a customized schedule for deep cleaning your specific home. We recently completed a series of home improvement projects. We painted our kitchen cabinets, replaced all the flooring on the main level of our home and made custom built-in cabinetry for our laundry room. Each of these projects involved clearing out the space. In some cases that meant moving things that hadn’t been moved in a really long time. What I learned was this – my house wasn’t nearly as clean as I thought. I’m pretty good at keeping up with the daily and weekly tasks of dishes, laundry, vacuuming, sweeping, cleaning bathrooms, etc. Where I found myself to be seriously lacking was in the details – things like light fixtures and window sills and doors. It never even occurred to me to wipe down my interior doors – at least not until we had to take them off their hinges and I got a close look at them. Ugh! All of our interior doors have inset panels with ridges where dust goes to hunker down for the long haul. It wasn’t pretty, but it was inspiring! This experience prompted me to create my own customized household cleaning schedule which I’m happy to say is working like a charm. Follow the simple steps outlined below to create a customized schedule of your own. The first step to creating an effective household cleaning schedule is to observe your surroundings with a renewed scrutiny. Make sure you have something to write with and take notes. Start with the ceiling and work your way down. Write down everything that needs cleaning. Are there cobwebs in the corners? Is your air conditioning vent growing fur? Are your light fixtures collecting dried bug carcasses? Write it all down like so: clear cobwebs, clean air conditioning vents, etc. Once you’re finished with the ceiling, work your way down to the floors making a note of every surface that needs attention. Make a point of seeing the things you normally overlook – things like baseboards and window ledges and vents. You can add additional categories or use fewer. It’s up to you (remember – it's customizable)! Once you’ve determined your categories, start prioritizing your tasks based on how frequently you feel they need to be done. 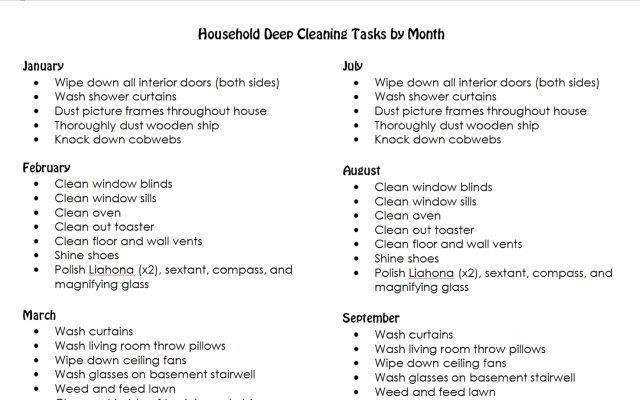 Click on the pdf below to take a peek at the household cleaning schedule I created for my home. Click on the image above to download a sample Household Cleaning Schedule. You will no doubt notice as you look over my household cleaning schedule that there are certain items which are clearly specific to my home and family. I deliberately decided not to edit my schedule so that you could see just how detailed and specific it is. That said, I feel the need to explain some things. For instance, under the daily category you will notice only one item: crack patrol. What, you may well be wondering, is crack patrol? ‘Crack’ is our family’s code word for dandelions. The essence of this task is roaming the entirety of the yard looking for evidence of the little demons and removing them by the roots before they can make more dandelions. The fact that we feel the need to do it daily is evidence of our failure to contain the problem. My husband, who harbors a mortal malice toward the hardy yellow weeds, is responsible for assigning them this appellation. I’m not going to pretend I get it, but it has stuck, so that is how we think of dandelion removal at our house. I promise there is nothing of a questionable legal nature going on. Really. The reason there are no more tasks listed under the daily category is that I was too lazy to print them all out. I felt like they were self-explanatory – clean the kitchen, wipe down the counters, etc. These things are so ingrained in our routine, they didn’t feel worthy of mention. Click on the image above to see how I broke down my household cleaning schedule by month. Once you’ve decided how frequently each task needs to be completed it’s time to determine exactly when each one of your infrequent tasks will be done. Infrequent tasks are those which are only done once a quarter, once every six months or once a year. Breaking them down according to month spreads them out over the course of the year, so that no one month is overburdened with tasks. Within each category (i.e. quarterly, semi-annually, annually) count up the number of tasks and divide them as evenly as possible over the months. For instance, under quarterly tasks I have identified 15 things I want to get done. Since there are three months to a quarter, I assigned five tasks per month. Every three months I repeat those tasks. 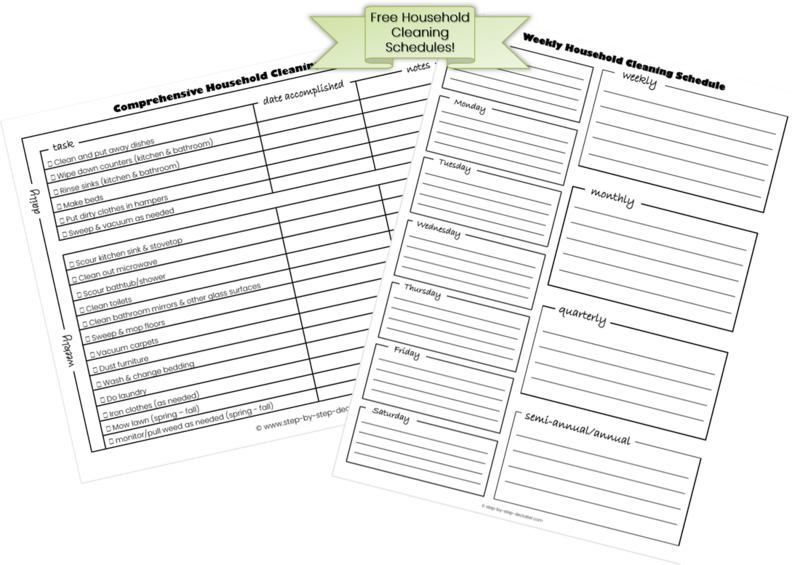 To make creating and implementing a household cleaning schedule easier, I designed these free printables. The Comprehensive Household Cleaning Schedule provides a big picture view of tasks that are necessary to maintain a clean home over time, and the Weekly Household Cleaning Schedule is for breaking things down on a daily and weekly basis. To gain access to these and other free printables, click on the image below.